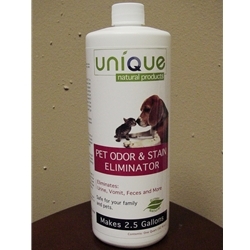 Pet Odor and Stain Eliminator By Unique. Eliminates stains from carpets and hard surface areas. Eliminates blood, grease, and all organic Stains. Safe, Non-Toxic, Effective; the best way to eliminate odors or stains is the natural way. Choose your quantity and size below and save. This is GREAT stuff!! My cat had a bladder infection and went to the bathroom everywhere in the house, no fault of hers. Until I discovered this product I was at wits end. Nothing could get rid of the cat urine odor, just mask it for awhile. This stuff totally eliminates the smell, have to say again - GREAT stuff! !